On July 30, 2018, State Councilor and Foreign Minister Wang Yi and Secretary of State for Foreign and Commonwealth Affairs Jeremy Hunt of the United Kingdom (UK) jointly met the press after co-chairing the 9th China-UK Strategic Dialogue in Beijing. Wang Yi said that Secretary of State for Foreign and Commonwealth Affairs Jeremy Hunt came to Beijing to hold the 9th China-UK Strategic Dialogue in less than one month after taking office, which fully shows the great importance the UK side has attached to the development of bilateral relations. Secretary of State for Foreign and Commonwealth Affairs Jeremy Hunt and I held fruitful talks just now, reaching many consensuses. We agreed that both sides should further enrich and elevate the strategic connotation of bilateral relations. 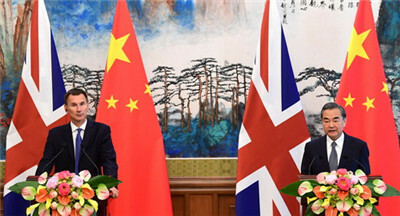 The leaders of both countries have reached important consensus on building the "Golden Era" of China-UK relations, which requires both sides to earnestly elevate the strategic significance, practicality, globality and inclusiveness of bilateral relations, so that the "Golden Era" will become more mature with more highlights and in a more stable manner. The two countries should view each other's development objectively, consolidate and improve strategic mutual trust, and pursue peaceful coexistence, benign competition and common development, so as to be a model of the new type of major-country relations. Both sides are willing to maintain the momentum of high-level exchanges and strengthen political guidance to relations between the two countries. The Chinese side welcomes more UK royal family members to visit China. The two sides will also well organize institutional dialogues in such areas as economy and finance, people-to-people and cultural engagement and security, and support the enhancement of exchanges in legislative institutions, political parties, locality and militaries. The two sides agreed that the Belt and Road Initiative should be taken as a handle to promote bilateral practical cooperation for upgrade and acceleration. The Chinese side expects the UK side to participate in cooperation under the Belt and Road Initiative in a more ambitious manner, and carry out first experiment and practice of trilateral cooperation, so as to strive for more early harvests. We welcome the UK leaders to attend the second Belt and Road Forum for International Cooperation to be held in China next year and welcome the UK side to be one of the guests of honor at the first China International Import Expo. The two sides agreed to actively integrate respective development strategies, expand the scale of trade and mutual investment, mainly promote cooperation in such areas as nuclear power, finance, and innovation, and expand cooperation in new industries and new business forms including artificial intelligence, green energy and digital economy. This year marks the 40th anniversary of China's reform and opening up. The Chinese side has announced and been already implementing a series of important measures to expand opening up, which will present opportunities for the UK to carry out mutually beneficial cooperation in broader areas, on larger scales and at deeper levels with China. The two sides agreed that strategic communication and coordination in international and regional affairs should be comprehensively strengthened. Against the current situation, China and the UK, as permanent members of the United Nations (UN) Security Council, should clearly maintain the rules-based international order and the multilateral trade system with the World Trade Organization at its core, and oppose all forms of unilateralism and protectionism. The two sides will also intensify communication and cooperation under the multilateral frameworks including the UN and the G20, promote the political settlement of international and regional hotspot issues, such as the Iranian nuclear issue, the Korean Peninsula nuclear issue, the Syrian issue and issues in Myanmar, join hands to address global challenges including climate change and counter-terrorism, and improve reform of the global governance system. We agreed to work together to promote the common prosperity on the Eurasia continent. The Chinese side believes that the prosperous, stable and open UK and Europe conform to the interests of all parties. The Chinese side also welcomes the UK to board the express train of Asia-Pacific development. Wang Yi said that the two sides agreed to continuously strengthen exchanges in various fields and consolidate the social and public opinion foundation for bilateral relations. Youth exchanges form a pioneering force in people-to-people and cultural exchanges. The UK is the most popular destination for overseas Chinese students in Europe. We are willing to introduce more visa facilitation measures to further intensify the two-way personnel exchanges, especially to encourage more young people to study and work in each other's countries. The two sides are willing to actively discuss the establishment of a high-level track 2 dialogue mechanism to provide more intellectual support for the sustained and in-depth development of China-UK relations. The Chinese side welcomes the UK side to participate in the 2019 International Horticultural Exhibition in Beijing.